3@1 Business Centre is celebrating it’s 20 year anniversary in October! If you are looking to invest in a leading business communications retail franchise, look no further. 3@1 are expanding across Southern Africa, into Africa and beyond. We are looking for exceptional people to become successful 3@1 Business Centre franchisees. The 3@1 Business Services franchise concept offers a retail opportunity in the business services and communications industry. 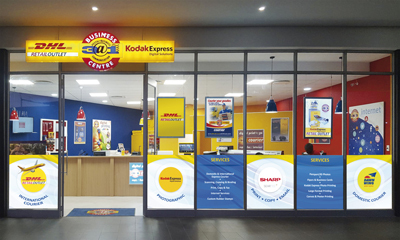 Boasting cemented partnerships with DHL International and Kodak Express photographic provider, our franchisees can offer an ever-broadening selection of services compared to our competitors. Established in 1999 this South African concept now sports a franchise network that is over 90 outlets strong in four countries, 3@1’s broad offering and personal support offered by the franchisor team appeal to franchisees from all walks of life, from ex-farmers to recent graduates, corporate players and housewives. 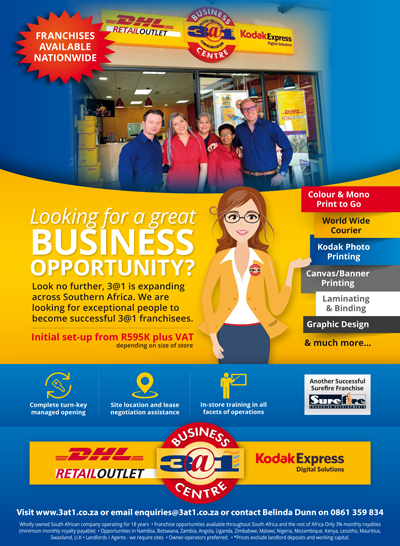 3@1 Service offering encompasses DHL Express, 3@1 counter to counter national Courier,Kodak Express offering Photo’s, Collages, Block mounting and Photobooks as well as ID & Visa photos. We also offer Business print, Broad format print and related services like binding, laminating etc. 3@1 now offers Business Registrations and image transfer services, plus a whole lot more! 3@1 Business Centre franchise is a complete full turnkey offering. Franchisees enjoy the support of the head office team every step of the way; from support with site selection to securing the lease, then through the planning phase to store set-up, training and the eventual store opening. The total setup cost may vary slightly, depending on the size and shape of the proposed location but starts from R595 000 ex VAT. Investors also need Landlords deposit 2-3 times rental around R45 000 ex VAT and Working capital of around R120 000. Apart from rapid growth throughout South Africa, the 3@1 is expanding in Namibia, Zambia, Botswana and Uganda. “The group is well positioned for expansion across Africa, and our next 3@1 Business Centre franchise will be opening shortly in Lusaka, Zambia”, says Franchise Director Belinda Dunn. Prospective franchises are encouraged to download an info pack at www.3at1.co.za, email enquiries@3at1.co.za or call 0861 359 834 for more information.